I saw this video being tweeted out by the Economist, a London-based weekly news magazine, this morning. It posits the idea that polygamy is strongly linked to violence in a society. Countries in which men can have more than one wife are more violent. How does polygamy destabilise society? If the richest and most powerful 10% of men have four wives each, the bottom 30% of men cannot marry. This assumes that in a society where men can have four wives each, that all of them will. This is not the case in most countries where polygamy is permitted or where it is part of the culture. It assumes that women will willingly submit to polygamy, which many in fact will not, especially when it means marrying a man who already has a wife, or wives. It assumes that nobody will marry for love, and be so content with each other that neither would consider marrying another. This is a rather racist assumption to make, as we know that there are men like this in our society, so why would there not be in a society where polygamy is in theory allowed? And in addition, not all men will marry women from lower social classes than themselves; in some places, to do so is taboo. Polygamy is banned in all western countries. But it’s common in the Islamic world, parts of Asia and Africa. It has been banned in the western world for most of its history, including times of heightened violence: the 1918-45 period of war in Europe, for example, or most of the history of the USA (the Frontier, the Civil War, the Jim Crow and Civil Rights eras). It was banned in Stalin’s Russia, Mao’s China and in the military dictatorships of South America. And many Muslim countries are peaceful and fairly orderly. In South Sudan, 40% of marriages are polygamous… So there is a shortage of brides. It can cost 100 cows to get married; poor young men cannot afford this, so some of them are tempted to pick up a gun and steal cows from neighbouring villages. Thousands of people are killed in cattle raids every year. This is one reason why South Sudan is blighted by civil war. For many young men, the alternative to war is celibacy. Is this the reason South Sudan is in a state of civil war, or is it a case of a liberation movement with various factions that started fighting each other once the common enemy (the state of Sudan) was driven out, or that leaders of one ethnic group (of which there are several, none of them accounting for more than 15% of the total population) were unwilling to accept the leadership of another? And no doubt the large quantity of guns floating around after independence, and of people (including children) trained as soldiers, had some influence on the speed at which the country descended into civil war. Few South Sudanese see the connection between these matrimonial customs and the country’s horrific civil war. If you ask them the reason for the violence, locals will blame tribalism, greedy politicians, weak institutions and perhaps the oil wealth which gives warlords something to fight over. All true, but not the whole story. Wherever it is widely practised, polygamy (specifically polygyny, the taking of multiple wives) destabilises society, largely because it is a form of inequality which creates an urgent distress in the hearts, and loins, of young men. If a rich man has a Lamborghini, that does not mean that a poor man has to walk, for the supply of cars is not fixed. By contrast, every time a rich man takes an extra wife, another poor man must remain single. If the richest and most powerful 10% of men have, say, four wives each, the bottom 30% of men cannot marry. Young men will take desperate measures to avoid this state. Again: it assumes that polgyamy being allowed, or practised to some extent, means that all men desire polygamy or that all women will accept it. Neither are the case. This is one of the reasons why the Arab Spring erupted, why the jihadists of Boko Haram and Islamic State were able to conquer swathes of Nigeria, Iraq and Syria, and why the polygamous parts of Indonesia and Haiti are so turbulent. Polygamous societies are bloodier, more likely to invade their neighbours and more prone to collapse than others are. The taking of multiple wives is a feature of life in all of the 20 most unstable countries on the Fragile States Index compiled by the Fund for Peace, an NGO (see chart). No. 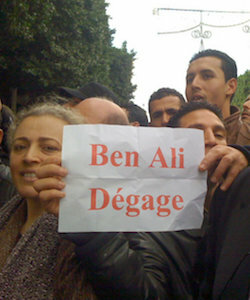 The Arab Spring originated in Tunisia, a country which had been ruled by secularists since independence in the 1950s which banned polygamy and stemmed from the tyranny of that régime and the poverty it inflicted on its citizens. Much the same was true of all the other countries affected. Some were monarchies (Bahrain) while others were republics (Syria, Egypt). The article notes that 19 of the 20 countries at the top of the “Fragile States Index” are countries that allow polygamy, yet the percentage of women in polygamous unions varies widely, with the central African countries having the highest polygamy rates yet the number does not go down the further down the FSI you go. The numbers with a fairly small rate are scattered throughout the group: Yemen is at number 4, Afghanistan and Iraq at 9 and 10; Sudan, Congo and Chad are in between with 20-40% of its women married polygamously. The list demonstrates my earlier point that polygamy being allowed does not mean it will be universal. There are sometimes good reasons for allowing it, notably at times when war has greatly reduced the male population and society needs to rebuild itself; if some women are having six children or more while others are single and having none, not everyone is going to be content with that and the women who have children will suffer a greater toll on their bodies than if they all had two or three. I am not going to give a detailed defence of polygamy (I have done so in the past; you can read them here) but in this case it is sufficient to point out that all the countries listed are affected by things that have nothing to do with polygamy — outside (particularly western) interference in their governance from the colonial era to the present day, third-world debt, climate change, natural disasters — that to claim that polygamy is in any way related to their recent violent history is ludicrous. It is a classic case of the “correlation equals causation” fallacy, when there is not a great deal of correlation at all and much of the apparent correlation appears to be coincidence. Next story Who’s behind “Survivors Against Terror”?